But the solution may have to come in the form of a new law rather than regulation. Federal agencies have in recent history concluded they don’t have legal authority to ban the devices themselves. Under political pressure after the Parkland High School shooting, President Donald Trump issued a directive calling for a new gun regulation. 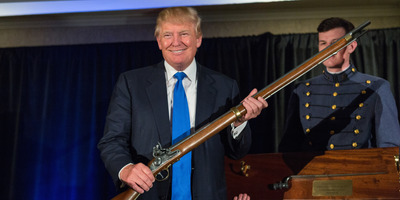 “I signed a memorandum directing the attorney general to propose regulations to ban all devices that turn legal weapons into machine guns,” Trump said at a White House event Tuesday. Trump was referring to bump stocks, the modification devices Stephen Paddock used to increase his rate of fire in October’s Las Vegas Strip massacre. The problem with Trump’s order is that, while federal law severely restricts the ownership of machine guns, a bump stock does not turn a semi-automatic gun into a machine gun, which is why federal agencies have in the past concluded they don’t have the legal authority to ban the devices. Wishing for a regulation to ban the devices doesn’t mean he can get one – or that such a regulation would stand up in court, if issued. A bump stock can cause a semi-automatic gun to behave similarly to a machine gun, using the gun’s recoil to rapidly “bump” the gun’s trigger back against the shooter’s finger. This modification allows the shooter to pull the trigger several times a second. But it does not cause the gun to fire more than one shot by a single function of the trigger. And in December, The New York Times reported that ATF officials were telling various federal and local officials that the agency would not be able to restrict the devices without new legislation, despite a regulatory review the Justice Department had already announced. Of course, executive branch officials have periodically changed their minds about what legal authorities they have. And if the Trump administration chose to issue regulations banning bump stocks, it would be up to federal courts to decide whether those regulations were legal or not. Sometimes, courts issue surprising rulings. But the Obama ATF didn’t beg off on bump stocks because it wanted them in circulation. It did so because the argument for prohibiting them is weak under current law. Just because bump stocks are legal doesn’t mean they have to be. Congress could pass a law prohibiting them, and the president could sign it. But the National Rifle Association has pushed Republicans to insist on a regulatory solution instead. This is an extension of bad trends: A dysfunctional Congress abdicating its responsibility to legislate even popular ideas, and an executive branch asserting ever-expanding power to pursue policy goals Congress won’t. And though the order may serve the president’s goal of looking like he’s doing something on guns, it’s likely to leave the country without a durable policy against bump stocks. If he really wants to do something, he should call for a bill to be sent to his desk so he can sign it.